Orakelkortlek med 44 kort av Diana Cooper. 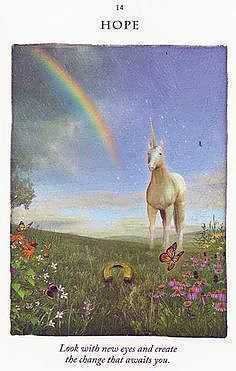 The magical, mythical beings of pure energy known as unicorns stand ready to help and guide humanity in this beautiful deck of affirmations, which features a unique unicorn on every card. 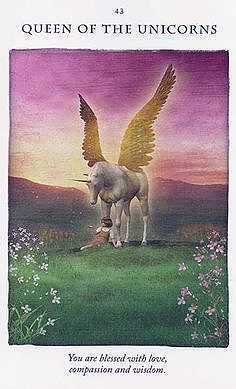 By attuning to the pack and drawing a card, users gain access to the wisdom of unicorns to help with meditation or daily navigation. The simple messages of guidance and inspiration will be welcome to both adults and children striving to connect with themselves and improve their inner lives. 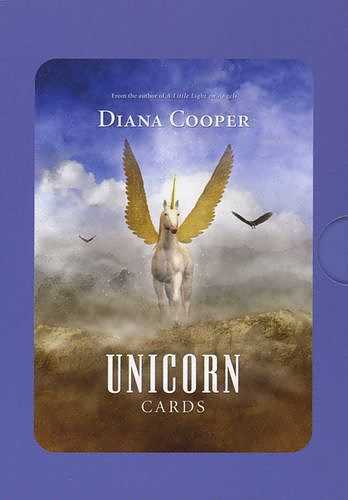 The popularity of Diana Cooper's Angels of Light Cards, which have sold over 80,000 packs since October 2001 is an indication of just how popular the UNICORN CARDS are going to be. What Diana did for Angels seven years ago she is now going to do for Unicorns… everyone is going to want to have a pack of these cards for their own personal use. This set of cards can be used on several levels, from simply picking a card for the day or week and attuning to the message from the Unicorns to following the instructions in the accompanying booklet on how to work with the cards.